There are six different types of synovial joint based on their shapes, each allowing a different kind of movement. Plane joints are flat and have slipping and gliding properties. Hinge joints are formed between the cylindrical end of a bone and the trough-shaped surface of another bone, allowing flexion and extension in one plane. Pivot joints are formed between the rounded end of the bone and a sleeve or ring of a bone, allowing up and down and side-to-side movement. Condyloid joints occur where an egg-shaped surface of a bone fits into a concave space in another bone, allowing flexion, extension, abduction, and adduction movements ( circumduction ). The saddle joint resembles a saddle and permits the same movements as the condyloid joints. Ball-and-socket joints occur where one bone ends in a spherical head and the other has a round socket, allowing all movements except gliding. ball-and-socket joint: A joint in which the ball-shaped surface of one rounded bone fits into the cup-like depression of another bone. 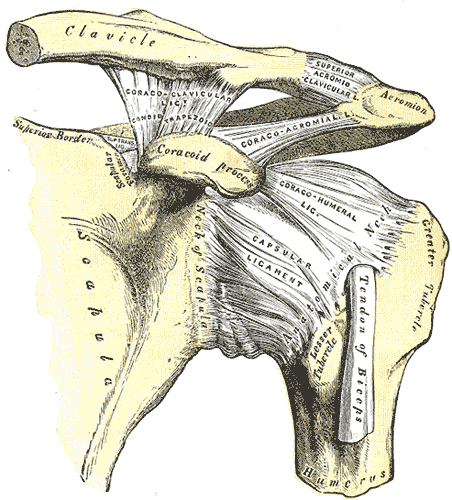 acromioclavicular joint: A joint at the top of the shoulder that is the junction between the acromion (a bony process on the scapula) and the clavicle. condyle: A smooth prominence on a bone where it forms a joint with another bone. Synovial joint: The most common and most movable type of joint in the body of a mammal. The articulating surfaces of the plane joint are usually flat to allow slipping and gliding properties. Examples include the carpals of the wrist and the acromioclavicular joint. A hinge joint (ginglymus) is formed when the cylindrical end of a bone fits into a trough-shaped surface of another bone, like that of an elbow joint (between the humerus and the ulna). These joints act as a hinge, allowing flexion and extension in just one plane. In a pivot joint, the rounded end of the bone fits into a sleeve or ring of bone. The atlanto-axial joint, proximal radioulnar joint, and distal radioulnar joint are examples of pivot joints. The condyloid joint occurs where an egg-shaped surface of a bone fits into a concavity in another bone. Examples include the wrist joint (radiocarpal joint) and the temporomandibular joint. Some classifications make a distinction between condyloid and ellipsoid joints, but both allow flexion, extension, abduction, adduction, and circumduction movements. The surface of a saddle joint has both convex and concave areas which resemble a saddle and permit the same movements as the condyloid joints. The carpometacarpal or trapeziometacarpal joint of the thumb (between the metacarpal and carpal, the trapezium) and the sternoclavicular joint are examples of saddle joints. A ball-and-socket joint occurs where one bone ends in a spherical head and the other bone has a round socket. This joint creates the ball-and-socket movement found in such places as the hip and shoulder (glenohumeral). This type of joint allows for all movements except gliding. The knee joint is an example of a compound joint/modified hinge joint where different types of joints combine. 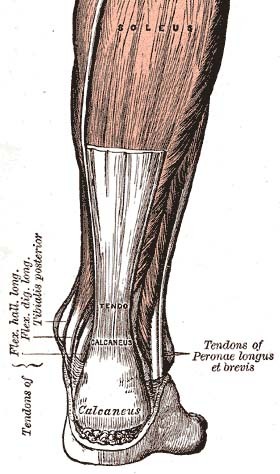 In this example, the condyles of the femur join with condyles of tibia and the saddle joint, where the lower end of the femur joins with the patella. Plane Joint: The left shoulder and acromioclavicular joints, and the proper ligaments of the scapula. 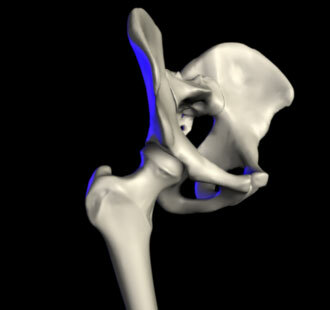 Ball and Socket Joint: Hip joint: the ball of the femur head fits in the socket of the acetabulum of the pelvis. Saddle Joint: Sternoclavicular articulation. 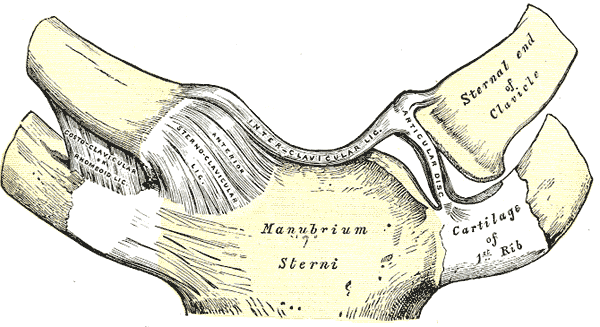 Anterior view.